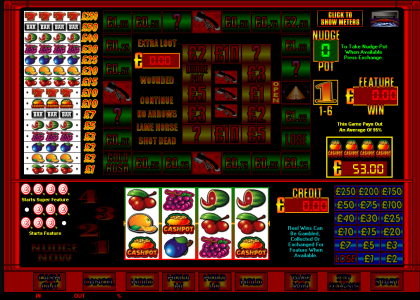 A UK type 4 reel club machine game with £250 Jackpot, an indian theme and 95% payout. Get 3 targets in a row left or right on winline to start feature, or 4 targets to start super feature. Reel wins can be gambled all the way to jackpot or collected at any time via high - low at risk of losing all. Wins can also be exchanged for feature at certain points shown. This game has our hide meters option and keyboard shortcuts. Once payment has been made please request your game code via email to activate your game fully. Game updates and codes are sent out as soon as possible.